REUZEL Groomin Tonic 11.83 oz. REUZEL GROOMING TONIC creates a long-lasting but natural feeling hold. Dispense into the palm of the hand, rub hands together and apply to damp hair. Comb through for even distribution and proceed to style. Trending at C $21.96eBay determines this price through a machine-learned model of the product's sale prices within the last 90 days. Reuzel Grease is strongest when applied to dry hair. Apply Reuzel Grease: Work an ample amount of Grease between the palmsof the hands until it warms and softens then apply thoroughly throughthe hair from roots to ends. Reuzel Mens Medium Hold Medium Shine Green Pomade, 12oz FAST FREE SHIPPING!!! 5 out of 5 stars - Reuzel Mens Medium Hold Medium Shine Green Pomade, 12oz FAST FREE SHIPPING!!! 5 product ratings5 product ratings - Reuzel Mens Medium Hold Medium Shine Green Pomade, 12oz FAST FREE SHIPPING!!! Easy to work into your hands and apply to your hair. A pomade for those who aren`t afraid to look greasy or who want height. a product from Holland. With more than fifty years of barbering and grooming experience, these Rotterdam Barbers have now formulated pomades worthy of their exacting standards. As old school barberís they dug deep into the history of pomades to formulate what is believed to be the worldís finestÖ Reuzel. Reuzel Grease is strongest when applied to dry hair. Apply Reuzel Grease by working an ample amount of Grease between the palms of the hands until it warms and softens then apply thoroughly through the hair from roots to ends. Fiber Pomade will texturize and increase fullness for a straight out of bed, disheveled look. THIS ITEM IS NEW AND SEALED. WE WILL DO OUR BEST TO ANSWER THEM. STOP IN AND CHECK IT OUT. HIPPIE HUT HOURS. WE ARE LOCATED IN THE CENTER OF. WE WILL DO OUR BEST TO ANSWER THEM. STOP IN AND CHECK IT OUT. HIPPIE HUT HOURS. Reuzel Grease Medium Hold 4oz Jar (green) - SEALED - Same Day Shipping! 5 out of 5 stars - Reuzel Grease Medium Hold 4oz Jar (green) - SEALED - Same Day Shipping! 22 product ratings22 product ratings - Reuzel Grease Medium Hold 4oz Jar (green) - SEALED - Same Day Shipping! 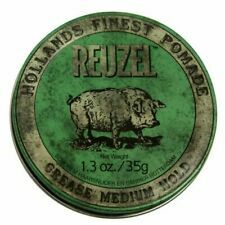 REUZEL GREEN Medium Hold Grease Pomade Hog Size 4 oz Free SHIPPING! 5 out of 5 stars - REUZEL GREEN Medium Hold Grease Pomade Hog Size 4 oz Free SHIPPING! 5 product ratings5 product ratings - REUZEL GREEN Medium Hold Grease Pomade Hog Size 4 oz Free SHIPPING! 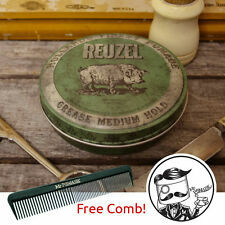 Reuzel Green Medium Hold Grease Pomade 4 oz + Free Comb! Directions: Put a little bit in palm. Work thoroughly into towel dried hair. Style as desired. 5 out of 5 stars - Reuzel Green Medium Hold Grease Pomade 4 oz + Free Comb! 22 product ratings22 product ratings - Reuzel Green Medium Hold Grease Pomade 4 oz + Free Comb! Reuzel Grease is strongest when applied to dry hair. Apply Reuzel Grease: Work an ample amount of Grease between the palms of the hands until it warms and softens then apply thoroughly through the hair from roots to ends. 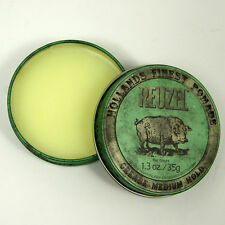 Reuzel pomade. LEEN and Bertus learned that hair cut, when they were just fourteen years old. With more than 50 years of experience, the two Rotterdam exception barbers now bring out their own sophisticated styling series REUZEL.